At this point, after countless articles written and recced, after I've gushed over the films and the comics and even made a variety of semi-unrelated points relevant by sheer force of will, I should not have to explain why I love Captain America so much. 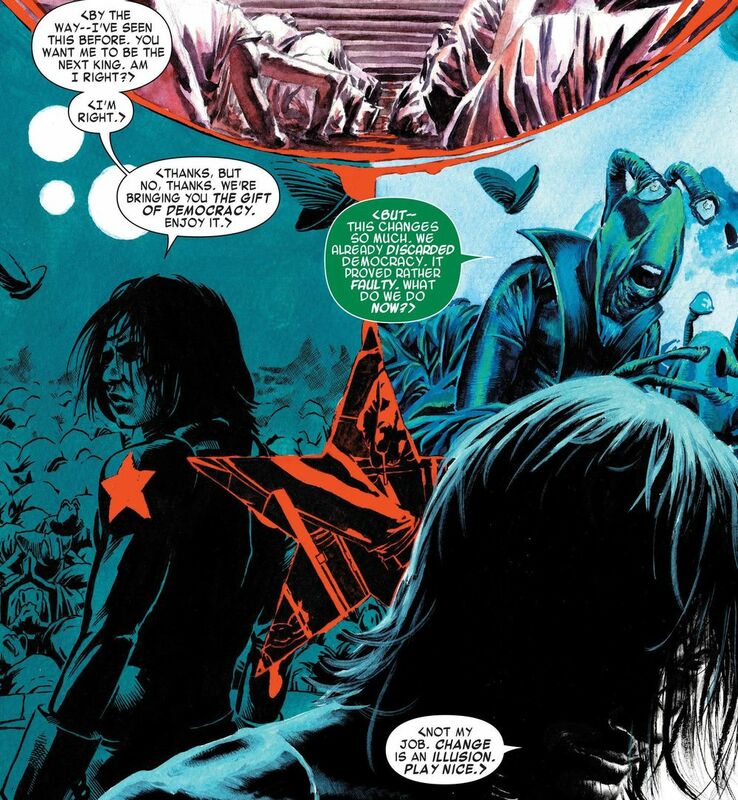 In all this, however, I'm not sure I ever got around to explaining why I love Bucky Barnes so dang much, so consider this the article to fill that hole. Now, a big part of why I love Bucky Barnes can be put down to the actor who plays him in the Marvel Cinematic Universe, Sebastian Stan. Stan, who I know mainly from the criminally underrated Kings, is an amazing actor who imbues his character with a kind of slow-moving devastation. Even in the scenes where Bucky is supposedly happy and everything is all right, he still seems unaccountably sad, a fact that gets even more pronounced as the films progress and Bucky gets piled with one of the worst lots in the entire Marvel Universe. But this article isn't about my adoration for Sebastian Stan's ability to look gutted and shattered while doing something as simple as cheering for his best friend. 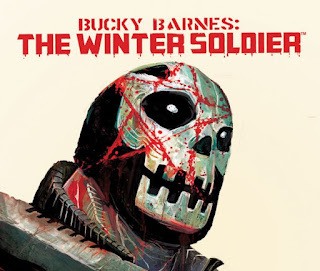 Nope, let's talk about a different version of Bucky Barnes who also deserves our appreciation: Bucky Barnes, the Winter Soldier from the comic of the same title. 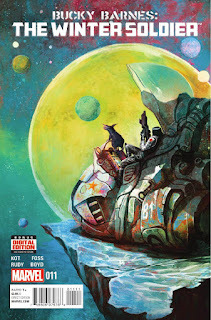 Now, like a lot of comics, this one defies logical explanation in the kind of linear plot-line that we typically expect, but that doesn't mean it's not a lovely comic. 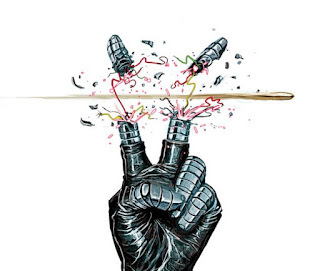 Written by Ales Kot with gorgeous flowing art by Marco Rudy, the comic explores Bucky's psyche more openly than most would be willing to do, and in so doing comments deeply on the issues of war and reconciliation. It's a compelling look at masculinity, albeit one that isn't quite straight-forward. Let's see if I can actually explain the plot of this comic without muddling it up: The story starts with Bucky Barnes and Daisy Johnson manning a space station to keep watch for extra-terrestrial threats to Earth. Through their monitoring systems they are basically manipulated by Loki into landing on a peaceful planet called Mer-Z-Bow and meeting with its queen, Ventolin. What's weird about this (besides most of it) is that Ventolin already knows who Bucky is. He is fated to be her lover and consort for an eternity there on Mer-Z-Bow. But that won't happen if the planet, which has been peaceful for millennia, suddenly gets tipped into civil war. The civil war can be stopped, but only with the help of another Bucky Barnes, this one from a timeline well into the future and a terrifying universe that has been completely destroyed. Destroyed by what? Destroyed by Crossbones and the Winter Soldier as they engage in a literally eternal war whose cause they can only vaguely remember. Both of them enhanced supersoldiers, the two can battle basically infinitely, the only casualties being everything else in existence. 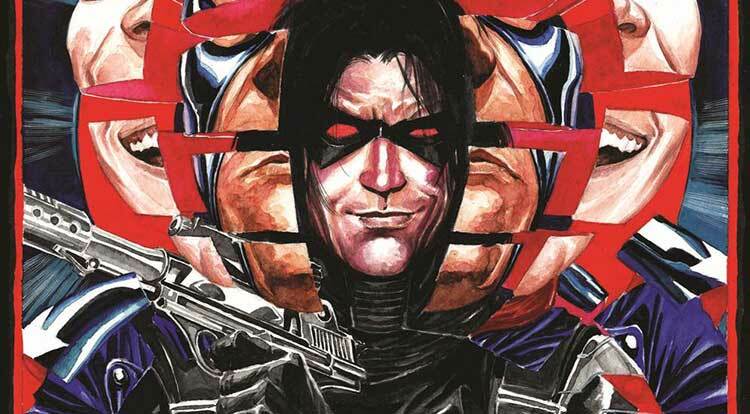 Crossbones has decided to take out his vendetta on another Bucky Barnes, this one the young and still very damaged Bucky who appears on Mer-Z-Bow. Like I said above, this is a weird story, and it's hard to explain if anything much actually happens in it. I mean, there isn't a lot by way of epic battles or big fight scenes or radically advancing the plot exposition sequences. It kind of just flows, like a really trippy river, trying to figure out what can and ought to be done. Should Bucky give up his newfound peace to fight Crossbones if it will save the people of Mer-Z-Bow? Or would fighting Crossbones at all just perpetuate the cycle of violence and bring this war to a new part of the multiverse? What is the right thing to do? What is the right way to be a hero? I guess I like this series, for all that it is one of the single hardest comics to read that I have ever found, because it openly admits there are no easy answers to these questions. Sometimes being the hero means sacrificing your own hard-won peace, and sometimes it means not fighting at all. Sometimes the heroism is in dying well, and sometimes it's not. There are no universal explanations we can cling to, this story says. No easy answers, no obvious choices. There's just a mess of life and death and hopefully happiness somewhere in the middle. The masculinity in Bucky Barnes: The Winter Soldier both is and is not the masculinity you expect it to be. On the one hand, the series really does examine the issues of toxic masculinity. The war between Crossbones and the Winter Soldier, the war that has leveled a universe, is a classic understanding of what masculinity can be when it is at its worst. Obviously this is a world of hypo-macho men. Crossbones and the Winter Soldier are both drawn rippling with muscles and covered in scars, your average action heroes. They're gruff and angry and mean. They fight because they don't know how not to fight. But there's another side to it too. 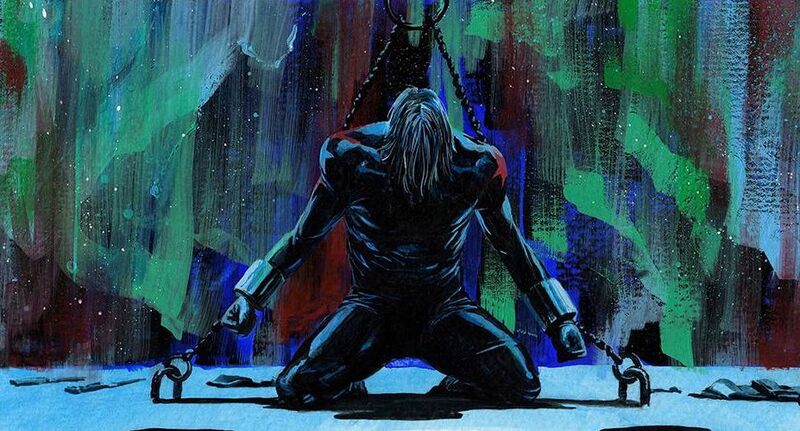 Our Bucky Barnes, the young one, is presented entirely differently, for all that he is the same man. He's got muscles, sure, but he's drawn in such a way to pull attention to his face, not his biceps. The emphasis with him is on his emotional state. He's looking for peace or redemption or something like that. Even Bucky isn't totally sure what he wants. The point, however, is that this Bucky already knows he doesn't want violence. He might be a tool designed for killing, but he is also a man who desperately wants rest. In talking with his younger, alternate self, it's interesting to watch the Winter Soldier slowly regain some of that softness. We see him clearly longing for the life that Bucky is about to start, reminiscing about his own days with Ventolin. Which, again, has really interesting implications. The idea that this Winter Soldier was once just like the peaceful man who wants rest and the idea that our Bucky might become this Winter Soldier one day. There's a duality in the story that can't be overlooked. It even talks about the source of Crossbones beef with Winter Soldier, which is both devastating and understandable. Basically, without getting into too much complex detail, years ago the Winter Soldier was involved in a war that destroyed Crossbones' (this alternate Crossbones, that is) father and home planet. So he swore revenge. It's the classic vengeance begets vengeance storyline, where no one can escape from the cycle of violence. What's so compelling, though, is how this story doesn't give an easy answer to the problem, but does insist that an answer needs to be found. I respect that. Generally speaking, that's where I come down on this whole comic. I don't always understand it, but I respect what it's trying to do. It gives us a storyline dealing explicitly with how the equation of masculinity and violence is inherently damaging as an idea. It pushes for more understanding and empathy while admitting that these are hard values to live into fruition. And it gives us an image of a male character entering into a romantic relationship without most of the baggage and crap that tends to accompany that. I think part of why this storyline works so well as an examination of toxic masculinity is because Bucky Barnes could so easily be a toxic male character. I mean, he's classically handsome but has a tragic backstory. He's a weapon built for killing. He's jacked. He's jaded. He doesn't know how to cope with his feelings. This could easily have been a story about how Bucky is the best and manliest and coolest and seduces the girl and beats the bad guy. But it's not. Bucky doesn't do much in this story at all except get in touch with his emotions and have a variety of really complex conversations with different people about who he really is. It's like if there were an entire James Bond film about James getting some well-needed therapy. So I like Bucky Barnes: The Winter Soldier. I can't lie and say that I understand all of it, and purely from a visual standpoint it's beautiful but hell to read, but I think it's a valuable addition to the discussion of masculinity in comics. It goes places other comics are afraid to and really embraces the ambiguity of ethics and personhood. I like it. You probably would too.